Interest and investment in blockchain technology, the recordkeeping infrastructure upon which Bitcoin is based, is widespread and growing. While capital clearly seeks a home in the virtual currency space, for the time being legal practitioners will have to interface with multiple regulators, including the SEC, the CFTC, federal banking regulators, as well as state regulators, all of which have asserted authority over virtual currency activities to various degrees. 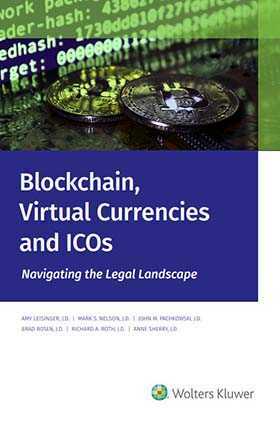 Blockchain, Virtual Currencies and ICOs: Navigating the Legal Landscape is a guidebook that will assist any practitioner that wishes to understand the world of virtual currencies and gain a measure of clarity with respect to the existing frameworks and central issues at play in this dynamic and challenging area. ¶310 The DAO Report: Must Initial Coin Offerings be Registered?